Home » TRAVEL TIPS » How to reach Aral Sea? 3 ways how to do it! 1. Getting there on your own. That type of adventure is usually organized through hotels (Jipek Joli, Nukus). Standard duration of the trip is two days but it may be extended unlimitedly at the client’s request. It’s just the question of price. Two-day option including hire of a car with a driver will cost around 400-450 dollars. You may choose from old Soviet off-road vehicles and modern-looking Jeeps. The price we’ve mentioned includes only transportation and usually you’d be offered additional services such as: food for 35 dollars/person for two days, rental of a two-person tent for 10 dollars, a sleeping bag -3 dollars. As you can see, taking your own victuals and equipment may considerably reduce the costs. Importantly, you may pre-book such a trip via the Internet (Jipek Joli hotel). Not many cars go in that direction, so if you don’t book a car in advance, it may turn out that all of them will unfortunately be reserved at the time of your visit. Several words about the route. During two days you need to cover few hundred of kilometers in total. On the first day you’ll drive for 8 hours from Nukus through Kungrad to the south-west coast of the sea. A significant part of the route leads through endless steppes. Contrary to what one might expect, it isn’t monotonous and when the weather is fine, you’ll have an opportunity to admire unforgettable views. The travellers spend the night in a tent with a magnificent view of a lake. If you get there, you definitely should make an effort to get up early and see the memorable spectacle of light over the surface of water during the sunrise. On the second day you’ll first reach a canyon created by the water which used to flow in it, and then, after driving for several kilometres through the bottom, you’ll reach Muynak where you’ll see the cemetery of rusting hulks and a museum. Organized trip is a safer option. The route is really difficult, mobile phones don’t work, and you’ll probably not see a living soul all along the way. Jeep drivers usually have satellite phones to contact the civilized world in case of some emergency. If you decide to take your own food with you, you have to protect it well. Tones of dust float in the air and it gets literally everywhere. The driver loads a big supply of fuel for the trip stored in somewhat leaking canisters. If you don’t protect the food well, it will be inedible after spending 8 hours in petrol vapours. 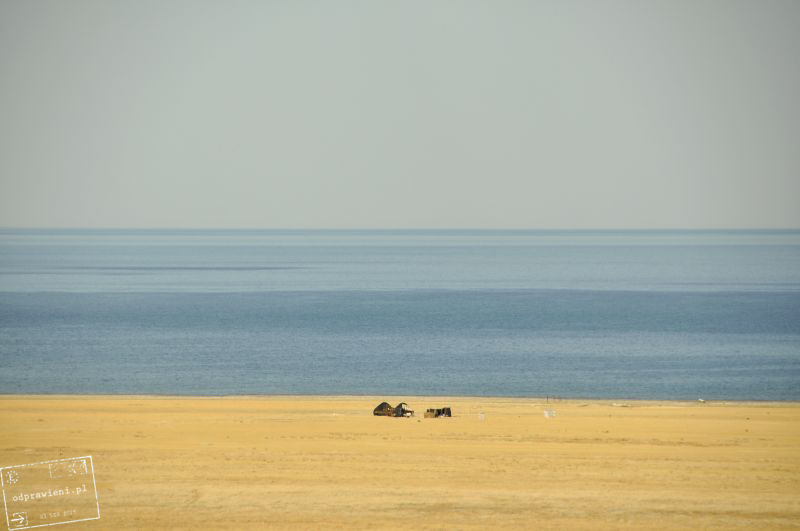 The Aral Sea , on the shore there is only one Chinese yurt, small shrimp farm. Chinese fishing shrimp in the sea and later sell as rare, exclusive commodity with health benefits. 3. Travelling by a passenger car. It’s definitely the cheapest and the most dangerous option of all. 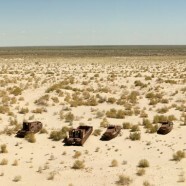 The locals may offer to you a trip to the Aral Sea by a Daewoo car. The price will be lower -for the transport, food, tents and sleeping bags you’ll pay only 400 dollars. However, a passenger car will be a limitation as it’s not adjusted to difficult conditions and unable to get into interesting off-road places, what means that you’ll miss some beautiful views. Also the journey will be much longer. If you’re determined to choose that option despite our arguments, call the driver called Ilkin (0555538030, 0708006388). He’s been driving to the Aral Sea by Daewoo Nexia for 20 years and enjoys unblemished reputation in Nukus. *Text was fully prepared by odprawieni.pl and used in guide book Central Asia published by publishing house Bezdroża (2014).